What kind of flooring do you want for your finished basement? We all know what the end result should be: a floor that’s durable, attractive, comfortable, and certain to stay that way for a long time. But it’s not easy to achieve these goals in the basement. That’s because basement conditions are different than those encountered upstairs. Even in a “dry” basement, the concrete floor is constantly absorbing and releasing moisture from the soil. You also have to consider what happens if there’s a plumbing leak or if water gets onto the basement floor for any reason. If your aim is to install a basement floor you won’t have to tear out later, you've come to the right place. Basement Systems offers a variety of basement flooring options to ensure you get the best value for your basement finishing project. Tired of cold, damp basement floors? Contact us today for a free basement finishing estimate. We offer a variety of subfloor and finished flooring options for the basement. Sometimes referred to as “underlayment,” the subfloor provides a flat, stable base for finished flooring. Plywood and OSB (oriented strand board) are standard “above-grade” subfloor materials that shouldn’t be used in the basement. 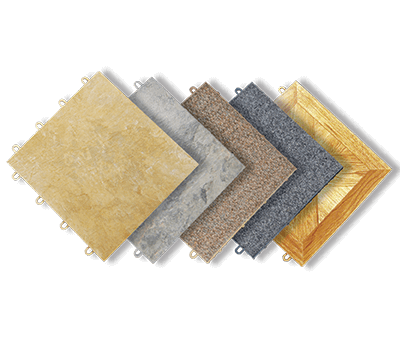 For subflooring that can’t be damaged by mold or moisture, we offer a variety of specialized subfloor products. If you install a waterproof, mold-proof subfloor in the basement, just about any type of finished flooring can be installed on this base. But it’s also possible to select special finished flooring that’s equally waterproof and mold-proof. To get this added measure of moisture damage protection, consider installing one of our basement floor covering solutions. 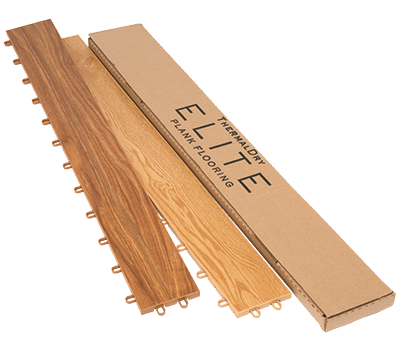 ThermalDry Elite Plank Flooring offers moisture resistance and durability while providing the warmth and beauty of a real wood plank floor. For a beautiful, durable, maintenance-free basement floor, consider ThermalDry® basement floor tiles. The snap-together tiles are available in a variety of surface finishes. 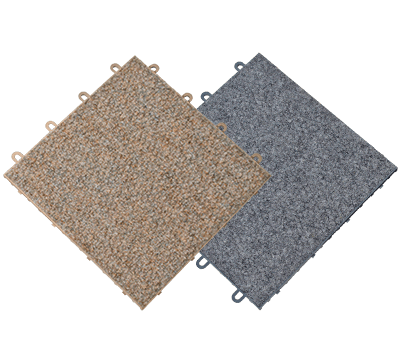 ThermalDry® carpeted floor tiles are immune to mold and moisture damage. The base contains interlocking joints for speedy installation and “nubs” that create an effective thermal and moisture barrier. 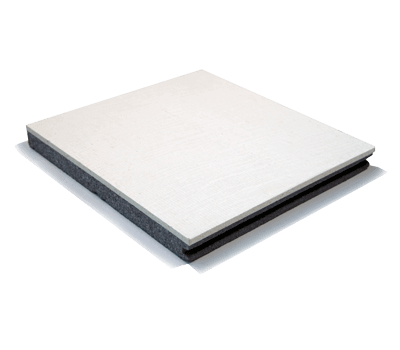 ThermalDry® Insulated Floor Decking™ is designed with high-performance foam insulation and an inorganic Magnesium Oxide board to keep basement floors warm and dry. ThermalDry® Floor Matting can’t absorb or be damaged by moisture. 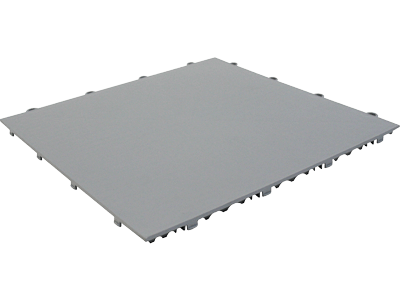 The underside of a ThermalDry® tile has a reinforced structure that provides a drainage plane and thermal break. Wood isn’t good. Wood subflooring works well upstairs, but it attracts mold and rot in the basement. Even special basement subfloor squares that contain wood sheathing can be ruined by moisture. 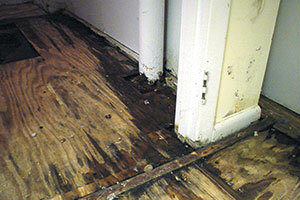 You can avoid these disasters by choosing the right subfloor and flooring materials. In the basement, flooring materials that absorb and hold moisture will attract mold and dust mites – organisms that ruin materials while also posing health hazards. Removing basement flooring that’s been damaged by mold and moisture is an expensive and unpleasant task you want to avoid. Fortunately, there are good alternatives to traditional “above-grade” flooring materials that shouldn’t be used in the basement. Our basement finishing products are made with inorganic materials that won't be damaged by mold and moisture. Contact your local dealer for a Free Estimate and to find out which products they offer. All of our dealers have the training and expertise to help you choose the best flooring solution for your basement.